Alfie Evan’s parents are still fighting for the life of their little son Alfie. 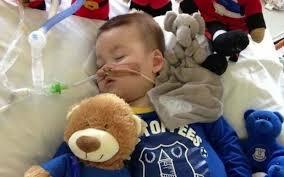 They are trying to prevent Alder Hey Children’s Hospital from cutting off Alfie’s life support without their consent. Alfie’s parents are trying another legal challenge to allow their son to stay alive. A a court ruled earlier this week that the hospital can shut down his life support. Tom Evans and Kate James are going to a Court of Appeal to ask judges to allow their 23 month old son to continue to receive medical care and treatment. I entrust to your prayer persons such as Vincent Lambert in France, little Alfie Evans in England, and others in several countries who live, sometimes for a long time, in a state of grave illness, assisted medically for their primary needs. They are delicate situations, very painful and complex. Let us pray so that every sick <person> is always respected in his dignity and cared for in a way adapted to his condition, with the harmonious contribution of the family, of doctors and of other health workers, with great respect for life. Last month, The European Court of Human Rights denied his parents’ request in moving him to a hospital that will actually provide him care rather than removing his life support. Although Alfie’s parents had already lined up a hospital in Rome,Bambino Gesu hospital, to provide him with a proper care and treatment plan, British courts as well as the European Court have sided with the hospital and its desire to yank his life support. Alfie was born May 9, 2016 and has a devastating degenerative brain disorder. Tom Evans obtained a letter from a pro-life attorney, Pavel Stroilov of the Christian Legal Centre, advising him that it would be legal for him to remove his son from the hospital — however the police prevented him from doing so. You have asked me to clarify whether it would be legal for you to remove your son Alfie from Alder Hey Hospital without the Hospital’s consent. In Alfie’s situation, that would be practical with the support of a team of medical professionals with the necessary life support equipment. Subject to that, I can confirm that such a removal would be lawful under English law. Alfie is only in hospital because you, his parents, voluntarily sought its healthcare services. Alfie retains the right to self-discharge from hospital. He is not imprisoned there. Because of his minority, it is for you, as his parents, to make a decision to self-discharge or to stay at hospital. The effect of the declaratory orders made by Mr Justice Hayden in the High Court is to make it lawful for Alder Hey to withdraw his artificial ventilation treatment, and to protect Alder Hey and its staff from legal liability for that step. It is not the intention or effect of the order to circumvent Alfie’s personal liberty or your parental rights. It remains lawful for an alternative team of medical professionals, with your parental consent, to provide such medical treatment to Alfie as they professionally deem to be appropriate. As you know, today Mr Justice Hayden made a further order scheduling the withdrawal of ventilation from Alfie [REDACTED]. The legal position may arguably become more complicated if someone within the High Court’s jurisdiction continues to provide ventilation after that point. However, there is no doubt that, until that point in time, it remains entirely lawful to provide ventilation to Alfie; and that can be done by a medical service provider of your choice. For these reasons, as a matter of law it is your right to come to Alder Hey Hospital with a team of medical professionals with their own life-support equipment, and move Alfie to such other place you consider is best for him. You do not need any permission from Alder Hey Hospital or the Court to do so.